Sixteenth-century English and Spanish colonialism in the Americas has a lot more to teach us about creating high-functioning product teams than it would otherwise seem. Just as some product teams succeed and others, well, don’t, one colonization approach led to arguably the most powerful and successful nation in human history, while another approach led to 300 - 400 years of volatile revolutions, fractious -- sometimes failed -- states, and political instability. What does “being light” even mean? Gaddis defines it as “the ability, if not to find the good in bad things, then at least to remain afloat among them.” Using Machiavelli, he summarizes it as “learning not to ‘sweat it.’” It’s navigating with prevailing winds instead of trying to fight a headwind. 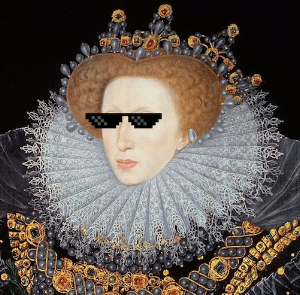 For Elizabeth I in the late 1500s, it was slow-playing decision making and knowing her capabilities. Instead of speeding to catch up with the Spanish and their decades-long head start, she let private corporations establish colonies -- with her permission, of course. She protected state money, ships, and men, let entrepreneurs shoulder the risk, and let them sweat the details as they saw fit according to the conditions they themselves experienced. This “absence of control,” this “lightness,” allowed those actually running these colonies to evolve their own forms of government bottoms-up, as long as they stayed within their royally-dictated charters. The thirteen colonies had “to respond frequently -- but not too frequently -- to the unforeseen.” Those self-created governments eventually led to the self-sufficiency, maturity, and independence that sparked the American Revolution and the founding of the United States. 1. Work with the team to clearly establish their constraints up front. This should be a reflection of the company vision, the product strategy, and the relevant business goals. It should help the product team know what is aligned and what is not aligned. Like the colonies’ royal charters, it should establish expectations between leadership and the teams. For example, if I’m a marketing company, my vision could be that we will measure everything for marketers to help them know how effective they are. The product strategy, thus, is to pragmatically and progressively measure critical channels. This quarter’s goal could be to increase measurement adoption of a certain channel that was launched the previous quarter. It’s up to the product team to decide how best to do so. 2. Set expectations on how to communicate progress. Leadership will want to -- and should -- have opportunities to check in with product teams. I personally think these check-ins should be more advisory than not, but orgs will differ. The goal of this is to ensure that whomever needs to know what’s going on does know and different functional teams are kept up-to-speed. This is more a case of don’t do what the British did by having unhealthy cross-oceanic relations and instead have healthy communication. 3. Protect autonomy as much as possible. Product teams will do, hear, measure, and see things that leadership simply won’t. They’re not only on the front lines, but are tasked with hitting business goals by whatever means. So, trust them to get the job done and let them do it. By giving them autonomy to make their own decisions and, thus, mistakes, you foster resiliency, which helps them navigate the unexpected. By the time the English even got around to getting serious about their North American colonies, Spain controlled almost all of South and Central America. Building product teams is difficult -- really difficult. It requires mutual trust and high standards, without a doubt. I think it can be tempting as a product leader to want to dictate or get in the weeds, but before you do, ask yourself: what type of colony and, eventually, country do you want to build? Geography was definitely a big contributing factor. If you want a deeper lesson on this, I highly recommend reading Tim Marshall’s Prisoners of Geography.